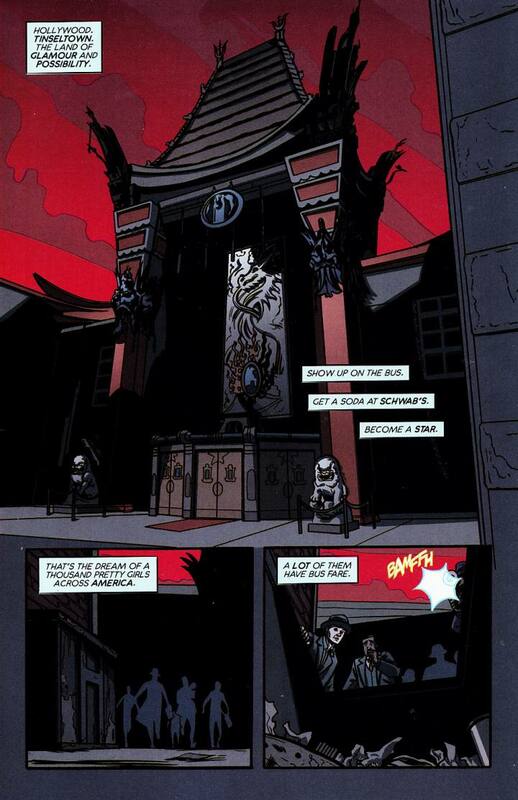 That opening dialogue takes place over the first three pages of Harvey and Levens’ first issue of Angel City, and, lover of Film Noir and classic-era Hollywood that I am, I imagine it delivered in a world-weary voice of someone who once aimed for the stars and was hit repeatedly by how low down and dirty the reality behind the screen magic actually was. A perfect Film Noir opening voice over, really, overlaying image of Grauman’s famous Chinese Theatre, but here silhouetted against an ominous bloody-red sky and long shadow, a hint of the gruesome scene we’re about to find just yards from where those oh-so-famous and glamorous film star hand prints are in the sidewalk by the cinema. the 30s/40s newsmen in their Fedora hats, flashbulbs (remember those?) popping brilliantly in the dark alley behind the movie palace, where a young, battered woman’s body lies among the garbage of the dumpster. It’s a chilling opening, within two pages establishing that Golden Age Hollywood setting and glamour then tearing back the curtain to show behind the scenes and the way so many young would-be starlets were eaten up by Tinseltown. One of the newspapermen, Joe, develops the photos in his dark room (a nice dramatic scene, the slow reveal of the image appearing on the paper under the red light, something you don’t get with digital, that pause, that reveal). And realises as he looks more closely that battered face in the press photo is someone he knows. 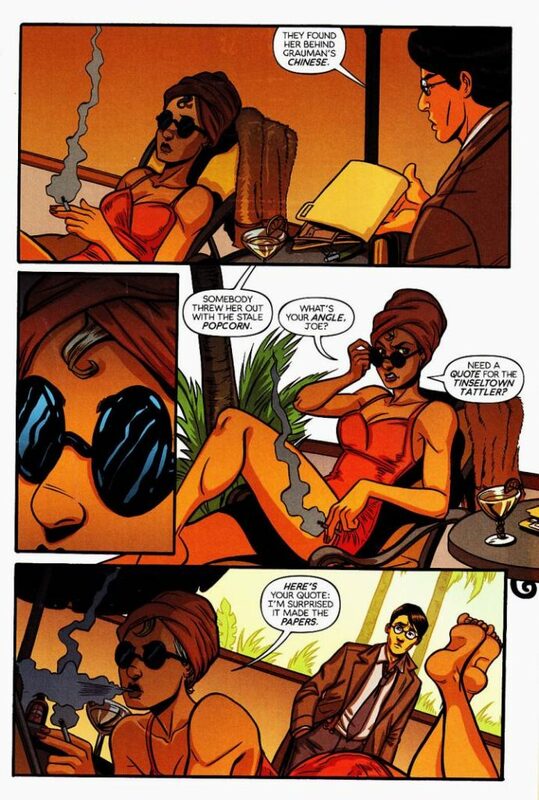 Or rather now someone he knew… He goes to call on Dot – now re-branded as Dolores (identity is plastic in La-La Land), who at first appears to be living the film star life – big house, palm trees, pool, lounging around in her swimsuit and oh-so-chic turban sipping a cocktail in the sun. And he tells her their friend is dead, brutally, dumped like yesterday’s old trash. She affects not to care – it was a long time ago they came out here to California seeking fame and fortune like so many others – and he leaves her angrily, informing her the funeral is tomorrow, as he departs. But Dolores – who was Dot when she and Frances Faye arrived on a Greyhound bus with their cheap suitcases and no money but a pocket full of dreams of making it in this town – can’t stop the memories. 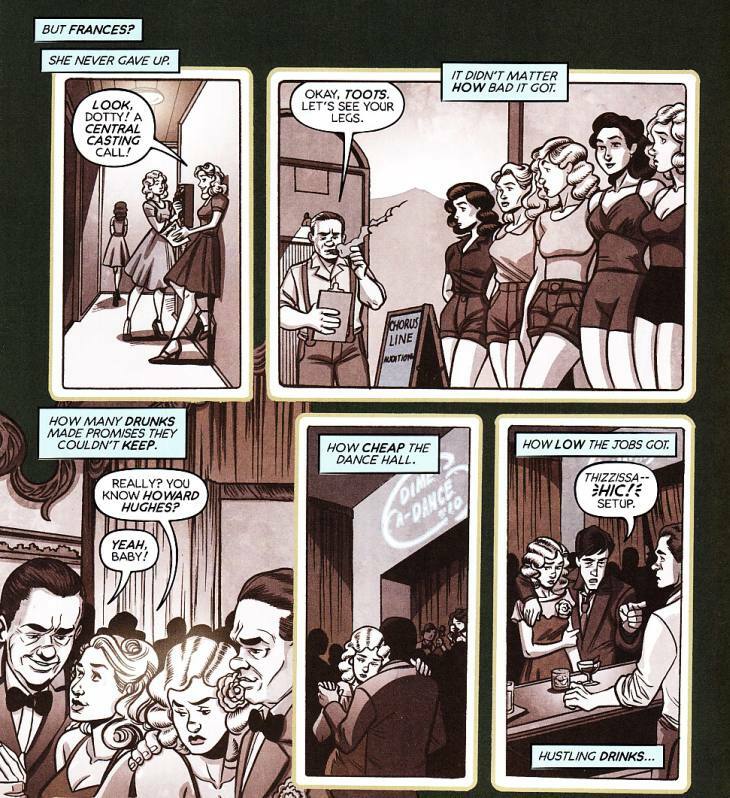 In sepia-tinged flashbacks (in contrast to the colour-drenched present day scenes, nicely crafted by Levens and Filardi’s artwork and colouring) we see them trying for everything – the cattle-calls of an open audition (let’s see those legs, toots!) to all the creeps and lechers in bars and clubs, full of promises of connections to famous producers and directors, in exchange for some companionship, in a city where pretty young flesh is the cheapest and most readily available commodity of all (and all some have to trade). And eventually Dot, before she becomes Dolores, in her bunny costume as the cigarette girl in the clubs. Except when one guy gets too fresh with her, Dot doesn’t take that pat on her bum, oh no, she turns around and clocks the guy with her tray. Catching the eye of the gangster who runs the club and who can use a feisty dame like her (although to be fair he does seem to develop genuine feelings for her too). No that first impression isn’t right, Dolores as he now calls herself is no movie star in her luxury home and pool, she’s working for a gangster. It’s a clever bluff and reveal by Harvey and Levens and given how closely the gangsters and the film set were often intertwined abck then in LA (and Vegas, come to that) it’s pretty appropriate to see her seemingly glamorous lifestyle comes from violence and crime hidden behind a veneer of respectable, wealthy living, a mask, just like those the directors and actors and producer who live in neighbouring big homes all wear too. This opening issue is dripping in nods to Golden Age Hollywood, right down to the presence of Eddie Mannix, the famous/infamous “fixer” for the old studio system (which could mean anything from hushing up and paying off old, undesirable boyfriends or an abortion for studio starlets to much darker and heavier actions to protect the carefully managed public persona of those stars), and it also oozes that Noir mixture of style and disturbance. 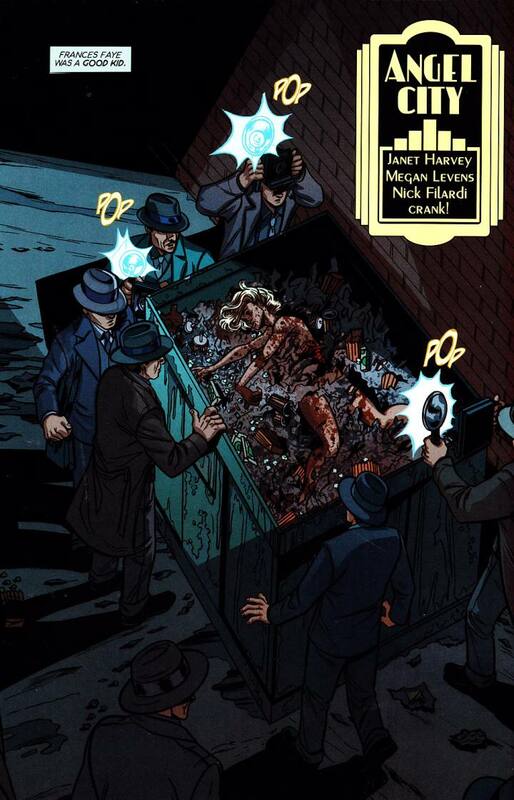 The reveal of poor Frances in the dumpster recalls the horrid, wretched fate of poor Elizabeth Short, the Black Dahlia, one of the most infamous and macabre unsolved murders in Hollywood history (later immortalised by the great crime writer James Ellroy as part of his LA Quartet). And that’s no accident as is revealed by the creators in an afterword, the Dahlia’s gruesome fate was an inspiration, along with the always-hushed-up but well-known knowledge of the systematic abuse of young starlets to be for the promise of a chance at silver screen fame (terrifying how many of those rumours were actually true, creatures like Trump would have been in their element back then). And that theme of the use and abuse of women – especially young, impressionable and desperate ladies – and the lingering threat and often actuality of the violence men hold over them pervades the story. And as recent events remind us – as if we needed reminding – that’s not something that vanished with the Hollywood of the 30s an 40s, it still lingers, it is still there, from the vile misogynistic rantings of someone like Trump to the internet trolls who try to silence women who dare to voice opinions with the threat of sexual violence. 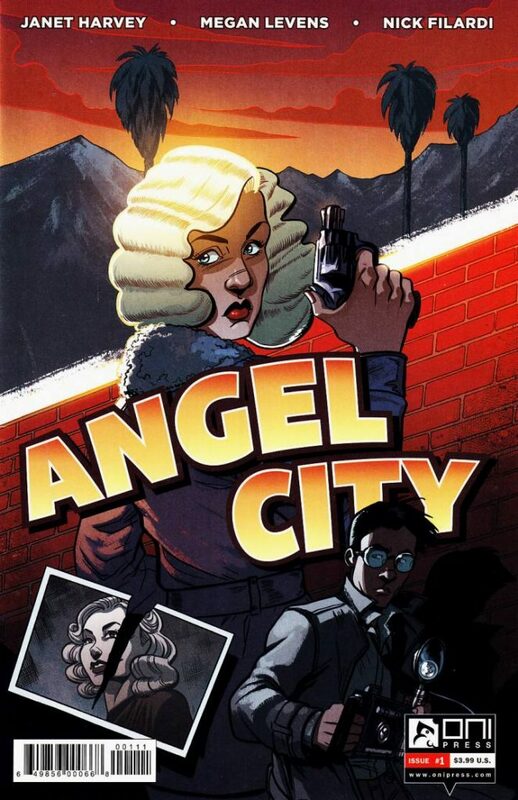 No, it’s still here, sickeningly here in 2016 when we should know better, and that makes Angel City not just an atmospheric period crime thriller, it makes it disturbingly pertinent to the modern day. If you enjoyed Brubaker and Phillips’ superb The Fade Out (reviewed here) or enjoy classic Film Noir then this is an ideal companion to read. And if you love that intoxicating and now vanished Hollywood of the period with its mix of glamour and sleaze I’d also recommend the quite excellent You Must Remember This Podcast by Karina Longworth.